It’s been nearly two months since I left the States, and I wonder how I’ve changed. It seems my Mandarin has not improved -- I am still a stumbling fool, but I forget, I am that way in English too. I came here to study the formation of identity through craft, but rather than forging an identity I think I’m losing whatever sense of self I thought I had. Here in Taiwan, I feel somewhat disconnected to who I was back home. I realize I find safety and belonging in routine, but here, with no set schedule, I am free to do whatever I want, to be whomever I want. I find that liberation terrifying. Yet I know this is what I’ve always dreamed of -- to go about my days in search of what I want, without worry about money. Maybe this is the time to also admit that I miss the US. The news coming across the ocean is devastating -- natural and/or man-made disasters, policies enacted by horrendous men in power. Still, being here I feel more American that I have ever felt. Growing up, it was always made clear by the other children on the playground that I was not American, but everyday in another country, I feel my non-belonging even more still -- my inability to read the signs, my constant concern that I am not using the proper words to address my teachers, my elders. I feel my American-ness. And I miss the crisp fall weather. I miss the changing colors of the leaves. This island is a lush greenhouse. The air is always moist and the plants are happy, lively, and green. It is a sight to behold -- the mountains blooming, blooming. And I delight in the flora and fauna that my eyes are beholding for the very first time, but at home alone, I dream of the oranging leaves and the yellowing grass. 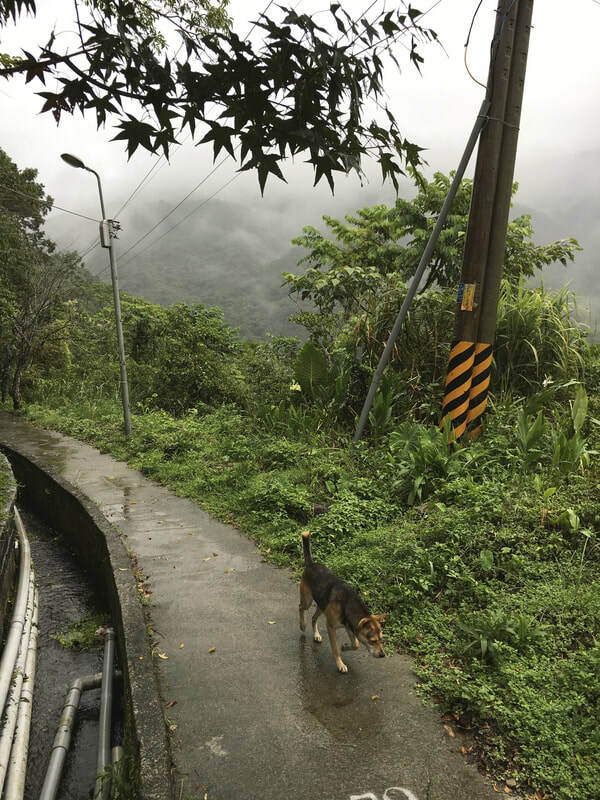 In my trips to Wulai, a town in the mountains where many Atayal live, I find that I am seeing flora and fauna that I have never seen before and also many adorable stray dogs. "...being here I feel more American that I have ever felt. Growing up, it was always made clear by the other children on the playground that I was not American, but everyday in another country, I feel my non-belonging even more still -- my inability to read the signs, my constant concern that I am not using the proper words to address my teachers, my elders. I feel my American-ness." I am immediately drawn to my natural surroundings. 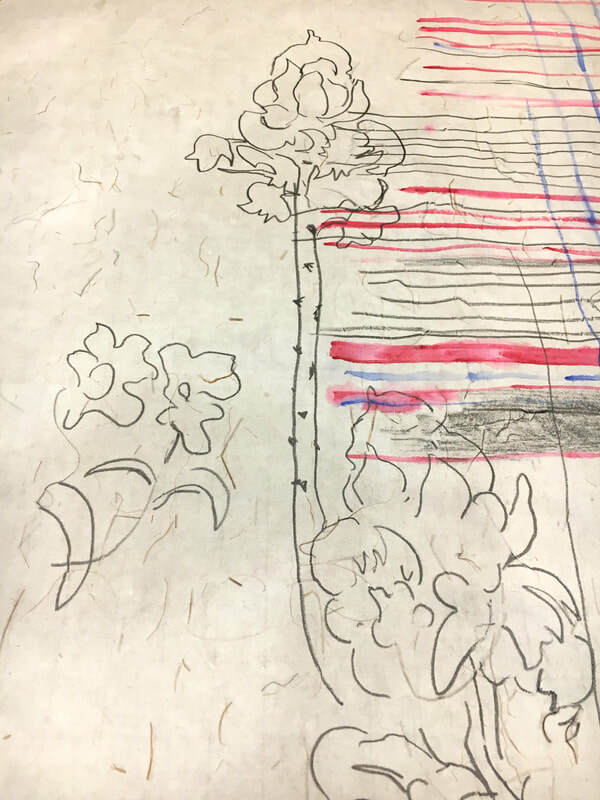 Although my plan was to draw the textiles I was studying, I find myself wanting to draw the flowers. Silence. The silence that colour may provoke is a mark of its power and autonomy. Silence is how we have to voice our respect for that which moves us beyond language. Silence is spoken by the body, through our gestures and postures. The body is one of the means by which we express ourselves when we run out of words. Colour spreads flows bleeds stains floods soaks seeps merges. It does not segment or subdivide. Colour is fluid. - Chromophobia, David Batchelor, pp. 83-86. ​Maybe this is what goo goo is all about. I am not interested in illustrating existing words. I want to tug on a thread that unravels something that refuses to be contained within our words. This thread attaches to some potential beyond our grasp. And I trust my body; it is better at communicating than this language uttered through my mouth. With my hands, I create objects and pictures that speak to this goo goo better than my words can. ​The Atayal have a spiritual concept of gaga; it is an animistic belief system with a set of religious rituals that promotes their belief in ancestral spirits and traditional moral values. Gaga includes the customs and ethics that are passed down from generation to generation. "Maybe this is what goo goo is all about. I am not interested in illustrating existing words. I want to tug on a thread that unravels something that refuses to be contained within our words. This thread attaches to some potential beyond our grasp. And I trust my body; it is better at communicating than this language uttered through my mouth. " 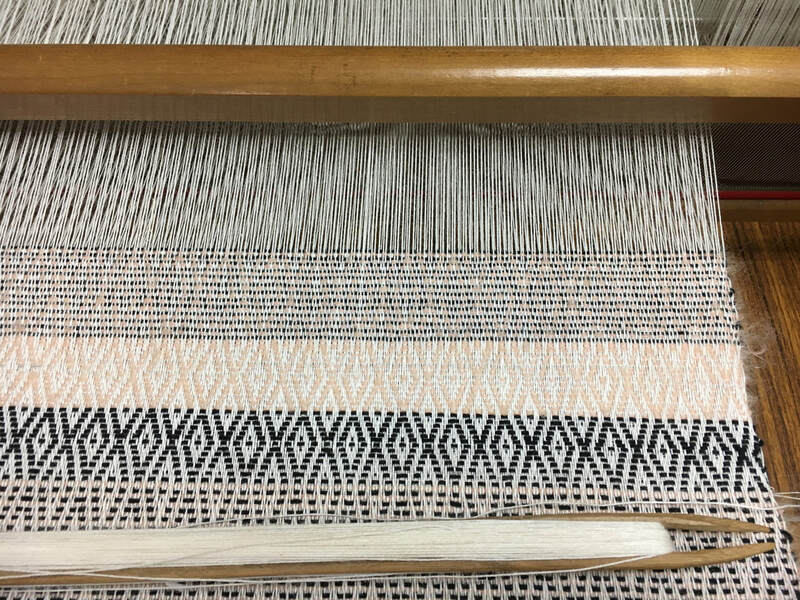 Sample weaving made on a frame loom. I cut my hair recently and am weaving some of my hair into it. The majority of the material is banana yarn, but there is also some cotton, mohair wool, and whiskery tendrils from the banyan tree too. 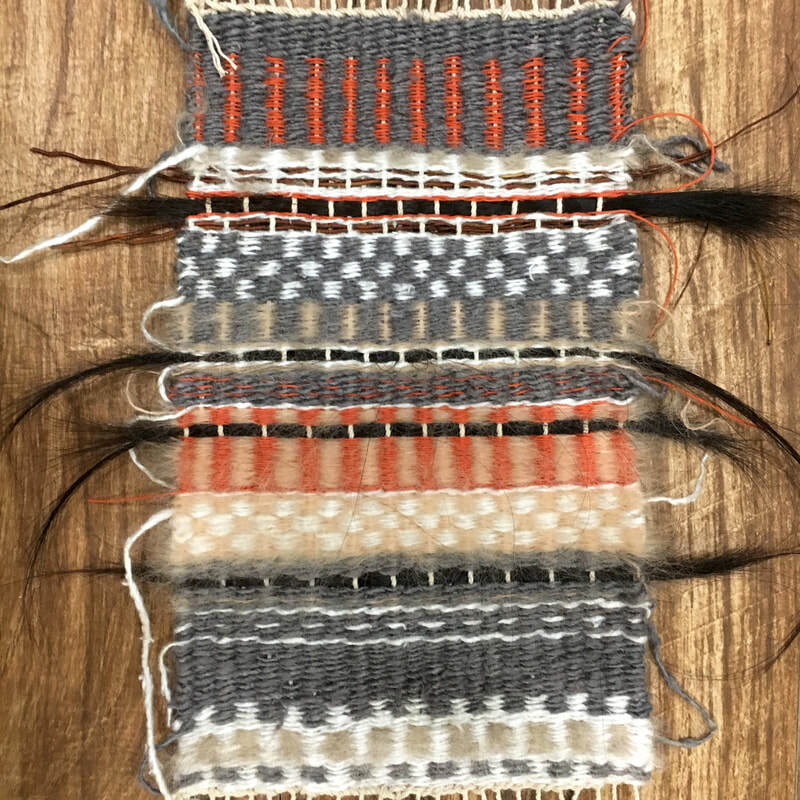 I like the idea of conflating all these different kinds of fibers -- from plant, animal, and human -- into a single cloth, to illustrate how we are one, working together, to form the fabric of our environment. One who observes the customs, taboos, and teachings is granted blessings by the ancestral spirits, while one who breaks it will be punished. Originally there was no social hierarchy in Atayal society, and instead the social structure and relationships were governed by the gaga. ​Goo goo gaga -- babies know what they’re talking about. Amazed that their bodies can utter such sound, exercising that wiggly tongue -- they know something we don’t, or maybe that we’ve long forgotten in order to participate in this society. They haven’t yet been confronted with, to quote bell hooks, our “imperialist white supremacist capitalist patriarchy,” the gross economic disparity that plagues our world and colors our experiences as we grow older. Goo goo -- Imagine the experience of beholding color, that nameless sensation of being overcome by the present. It’s okay if you don’t have the words; not everything can be translated into quantifiable descriptions. Gaga -- Imagine the animism of the Atayal, the possibility that objects, places, and creatures possess a spiritual essence. Can the respect of all things, living and otherwise, give structure to our relationships with one another and the environments we inhabit? "“Ah-yo! Tah jah keh-len. Heh beh ah-nah tan-si?” (Romanized Taiwanese for How sad! How do you make money with that?)." Weaving with the Atayal women, I wonder what qualifies me to be here, to acquire this specific skill. It’s true I am thirty, forty years younger than a lot of these women, that they say their own children have no interest, but this lack of interest is an economic problem. One cannot make a living weaving, and it is because of my privilege that this desire exists within me, to know to apply for a Fulbright, to learn their weaving traditions. As an outsider, is it fair that I am the one that gets this opportunity to learn, and is my weaving of their patterns appropriation? How can I express gratitude, give back to this community that has shared their space with me and has taught me their traditions? I am often asked how I can help make Atayal crafts more commodifiable, more marketable, and I want to help, but I honestly don’t know how in a business, “art as commercial venture,” sense. Yet I understand that until there is money in this business, Atayal weaving will remain a niche skill, acquired by outsiders such as myself, and that is not right either. Over Skype, I show my parents my weaving on my newly acquired traditional Atayal backstrap loom, and their reaction is, “Ah-yo! Tah jah keh-len. Heh beh ah-nah tan-si?” (Romanized Taiwanese for How sad! How do you make money with that?). Here (or rather everywhere in this global capitalist society), there is such pressure to value product over process and (technological) progress over preservation. 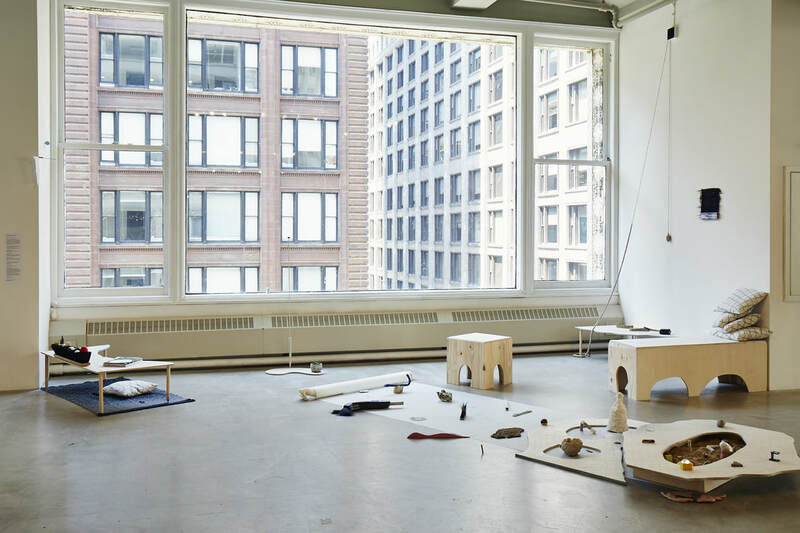 Outside my art school bubble of these past two years, I am learning how to defend my values. But still, I fear I’m stuck in the realm of dreamers, that I refuse to be woken up. Must I conform to this market capital mentality? I don’t know. Goo goo gaga. Weaving on western-style table-top looms in Wulai. Many weavers use these looms as opposed to the traditional Atayal looms because they have multiple harnesses and thus easier to create more complicated patterns, like the diamond pattern, that is symbolic of the protective eye in Atayal culture. Here are some of my variations on the eye pattern. We combine tools from both Atayal and western weaving traditions; we use a western style loom but bamboo shuttles, that are used in the traditional Atayal looms. "Here (or rather everywhere in this global capitalist society), there is such pressure to value product over process and (technological) progress over preservation." 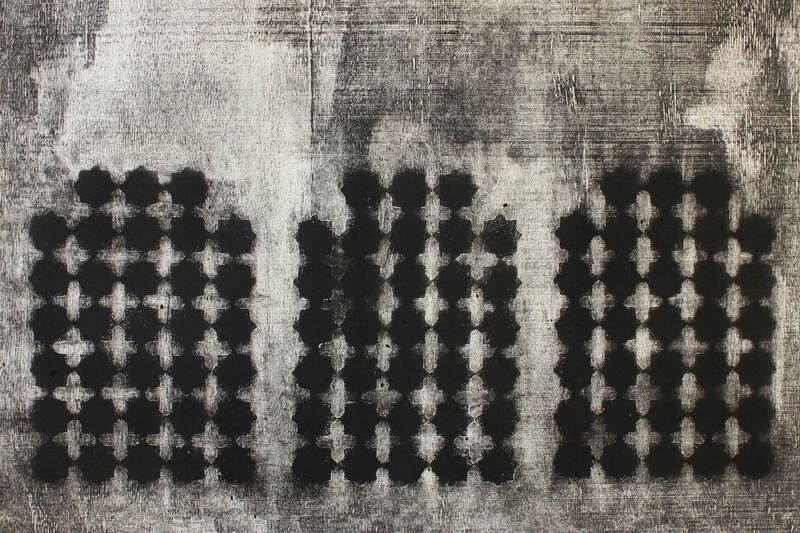 In the mean time, click bellow to read past Goo Goo articles by Jennifer Chen-Su Huang! Goo Goo Guide is a monthly article! Subscribe to Venison Magazine to be notified of the release of our next Goo Goo!